Brief Synopsis – A young teenager at odds with his parents tries to make sense of the life he is living. My Take on it – This is a film that people have lauded for decades and after having seen it once 17 years ago, never really felt the urge or need to watch again. Now that I’m watching many of Natalie Wood’s performances, I decided to give it another try. Many of the themes discussed here are actually quite timeless because they deal with the gaps between teenagers and their parents and vice versa. Both sides have trouble understanding the other and no matter what they try to do, it’s hard to find some kind of common ground due to different perspectives on life and how things are done. Some of the themes here feel very essential to being part of the 1950’s culture, but when you look deeper, it’s easy to see how they can relate to things happening even today. The cast of James Dean,. Natalie Wood and Sal Mineo are all great and each of them gives a very realistically believable performance here. They try to show how people do things because its easy or actually for no real reason what so ever, perhaps just out of boredom and that is pounded into the story over and over. Dean died tragically just a few months before this film was released which is sad because this film really showed how much potential he had as an actor had he lived. Bottom Line – The story presented here is quite timeless because it deals with the way children have trouble identifying with how their parents act and vice versa. 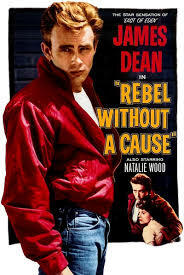 The main cast of Dean, Wood and Mineo is great and they all seem quite believable as troubled teens. Part of the themes discussed here seem too connected to the 1950’s, but it’s easy to find connections to teens nowadays also. The idea that people do things without any reason, perhaps just out of boredom or because it’s easy is very prevalent here. This film shows how much of a future was possibly in store for Dean had he not died tragically a few months before the film was even released. Recommended! Tragedy followed the main stars as you pointed out in the trivia. Such a powerful film. A great movie, but sad that such tragedy surrounded all three main stars.